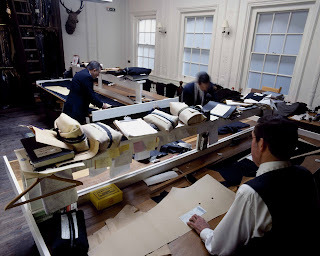 In the cutting room at Anderson & Sheppard, under the front table on the right, is a cardboard box with swatches of all the cloths the firm has made up for Prince Charles. It’s secured with two rubber bands; because without them it wouldn’t stay shut. 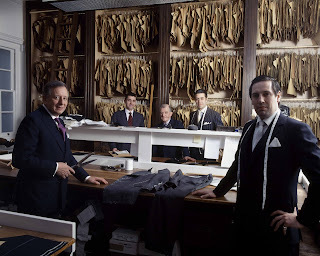 In a way, that is one small illustration of the tailors’ heritage (as well as its client satisfaction). All those patterns, weaves and wools; that have been made into suits, trousers, kilts and overcoats. Taking up rather more than their fair share of room in the box are two pockets. They are patch pockets that were replaced on one of HRH’s jackets. Why both are kept as a record I don’t know, and didn’t ask. But the texture and colours in the tweed is lovely. Unfortunately, head cutter John Hitchcock pointed out to me that an old, multi-coloured tweed had been replaced by a duller version in the bunch – the variegated original just wasn’t made any more. Such a shame, for I swear it had every colour imaginable in there, in greater or lesser quantity. 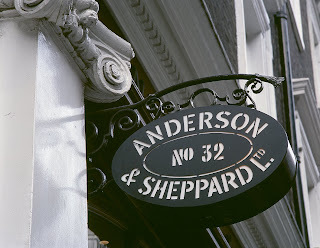 Speaking of tweed, if you do get a chance to visit Anderson & Sheppard then look out for their house tweeds hanging up on the left, just before the cutting room. In particular, the blanket of various colour patches that the mill sent A&S so it could pick a few to stock. So attractive is the blanket that one customer had a suit made out of just that material, patches and all. John Hitchcock was kind enough to give me a short tour last week, which is how I got to rummage around in Charles’s leftovers. Other points of interest included the silk thread used for sewing the jackets (or coats, to be strict) and how the natural stretch of the silk, combined with the hand stitching, creates natural give in the shoulders and chest. It’s pretty hard to break silk thread; by comparison, normal thread snaps like a twig. All the suits waiting to be collected or fitted are kept on normal, slim wooden hangers. Of course a hanger with more support for the shoulders is recommended for long-term storage, but it does rather undermine the hyperbolic claims made about wide hangers and collapsing shoulders. And lastly I never knew what determined the roll of a jacket’s lapel. True three-button lapels sit so stiff and square, whatever their canvassing and no matter how it is attached to the jacket front. Apparently, the key is how close the canvas is to the edge of the cloth. Give it room and keep it loose and the lapel will roll easily to whichever button you choose to fasten. In the image below, the staff are: John Hitchcock, managing director and senior cutter; Colin Heywood, shop manager and sales consultant; Michael McSkimming, accounts; Karl Mathews, sales consultant; and Leon Powell, under cutter. You can follow the discussion on A visit to Anderson & Sheppard by entering your email address in the box below. You will then receive an email every time a new comment is added. These will also contain a link to a page where you can stop the alerts, and remove all of your related data from the site. Dear Simon, First of all thank you for taking so much time to show us all these wonderful details. To us who follow your blog, it’s a few minutes of reading and viewing. Yet for you it takes considerable time to visit Anderson & Sheppard, take photos, edit and upload them, plus write your wonderful posts. Second, the lower of the two photographs is gorgeous! Not only because of it’s technical quality, but of how it captures the ‘soul’ of both the establishment as well as of it’s employees. Very well done. And finally, I hope that the good people at A&S appreciate all the word of mouth promotion you’ve been giving them online. I guess that’s just the value one gets in return for treating his clients well and providing a superior product. Great article. First George Cleverley now Anderson & Sheppard. You really are hitting the best spots in town! Excellent article, as always. This blog goes from strength to strength.